I remember the time I first picked up an e-cigarette. It was all very simple. It was a little cigarette-sized device with an in-built battery, and to charge it you just had to screw it into a USB charger and wait for the light at the end to turn green. It was foolproof. Little did I know that several years later I’d be writing a whole blog post about the technicalities of advanced, removable vape batteries. They might not be quite as foolproof or simple, but they definitely have their advantages when it comes to the needs of a vaper. If there’s a new mod you’ve got your eye on, you might be considering braving the learning curve and delving into the world of external vape batteries. Thankfully, despite some over-enthusiastic vape shop workers occasionally overloading you with jargon, the main things you need to know to use a device with separate batteries are mercifully simple. 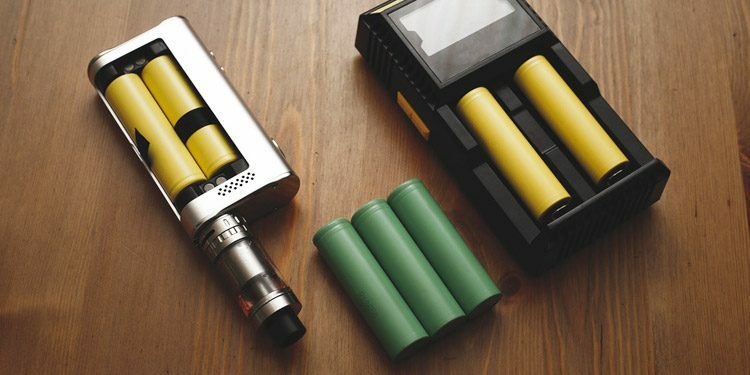 From getting to grips with the different sizes of vaping batteries on offer to finding out the key bits of information you need to stay safe when you’re vaping and learning about special considerations for multiple-battery devices, this post gives you an in-depth explanation of everything you need to know to vape with separately-bought batteries. This is a long post. For essential need to know, download our cheat sheet – essential need-to-know in a downloadable, printable pdf. What Are External Vape Batteries and Why Would You Use Them? What is the Right Battery for Your Mod? So how do you know which batteries are safe? Buying Batteries: Can You Trust the Advertised Amp Limit? Are External Vape Batteries Right For You? External vape batteries are simply batteries that don’t come pre built-in to your mod. Like any other battery you use in day-to-day life, they have a positive end and a negative end, and current then flows from them when you attach both terminals to a circuit. For vaping, the most common type of battery is the 18650, but regardless of size, they all have the same basic design and perform the same function. The most important things to be able to recognise on a vape battery are the positive and negative terminals. This is really easy to do: the negative end is always completely flat, and the positive end has a little button on top or a smaller raised terminal, with an inset ring in the body just below it. Look for the ring on the body of the battery, and you’ve found the positive end. While devices with in-built vaping batteries (like the Coolfire Ultra TC150) are undoubtedly easier from a user’s perspective, there are a lot of benefits to using devices with external batteries. Internal or External Batteries: Which should you use? First, and most of all, you can replace the battery when it reaches the end of its life rather than having to replace your whole mod. This saves you tons of money, and means that upgrading your battery is always an option at any point. If your battery runs out when you’re at work and you use an in-built battery mod, you’ll need to recharge, but with an external battery mod you can just bring a spare with you and pop it in. Choosing your own battery also gives you more freedom to choose a battery that works for you – for example, if you value battery life over performance, you can choose something to suit that rather than being stuck with whatever your mod includes as standard. Batteries all store chemical energy and convert it to electrical energy, which in turn powers your device. They have two electrodes – a positive one called the cathode and a negative one called the anode – an electrolyte and something to separate the cathode and anode. The chemistry of a battery tells you what materials it uses, and for most vaping batteries – and most modern batteries in general – lithium characterises their chemistry. The anode for lithium ion batteries is made from carbon/silicon and graphite, but the cathode material differs and gives each battery unique characteristics. When you buy a vaping battery, it will be identified by a series of letters like “IMR” or “ICR,” and these tell you about the make-up of the battery. The “I” means lithium-ion and will be the same for any battery you buy for a vaping device, and the “R” stands for rechargeable. However, the other letters tell you other materials used in the battery. IMR (Lithium-manganese) batteries allow a lot of current to flow without increasing the internal temperature of the battery too much. This makes them much safer to use for vapers, and they don’t need protective circuitry built in because the design is intrinsically safe. INR (Lithium-manganese-nickel) batteries offer many of the benefits of IMR batteries (largely due to the manganese), but add nickel to produce a “hybrid” chemistry battery. In practice, this means INR batteries offer high current, low operating temperatures and higher capacity than IMR chemistry batteries. Popular vaping batteries like the Sony VTC 4 and 5, the LG HE2 and the Samsung 25R use INR chemistry. ICR (lithium-cobalt) batteries are the highest-energy battery chemistry you might use for vaping, but they don’t do as well as the others when it comes to safety. They need additional protective circuitry (which is added by a third-party company) to be used in a mod, but they are very limited because the highest current you can safely use them at is shown by the mAh rating (which we’ll cover in more detail later). Battery University is a great site with some more detailed information on lithium ion battery chemistries, if you’re interested. The size is another key characteristic that the name of the battery you buy will convey. The standard batteries used for vaping are called “18650” batteries. This can be broken into two key parts: 18 and 65. The 18 tells you the diameter of the battery in mm, and the 65 tells you the length of the battery, 65 mm. So an 18650 battery is 18 mm in diameter and 65 mm tall. If you encounter an 18350 battery, you’ll instantly notice that this will be the same thickness as an 18650 battery (18 mm), but much shorter (35 mm vs. 65 mm). Similarly, a 14500 battery is both shorter and thinner than an 18650 battery, and a 26650 is much wider but the same length. So now, if an enthusiastic vape-nerd tells you about their new 18650 INR battery, you can break down exactly what that means. You know INR batteries are lithium ion (“I”), use nickel (“N”) in addition to manganese and that it measures 18 mm in diameter by 65 mm in length. Now you’ve had a brief crash-course in battery chemistries and sizes, you can start to think about what the best battery for your mod will be. There is a lot to consider if you’re looking at getting the very best performance, but all you need is your mod to find something that will get the job done. The main things to think about are: the size of the battery, how many you need and your safety requirements. Most mods on the market still take 18650 batteries, but there are some exceptions to this. 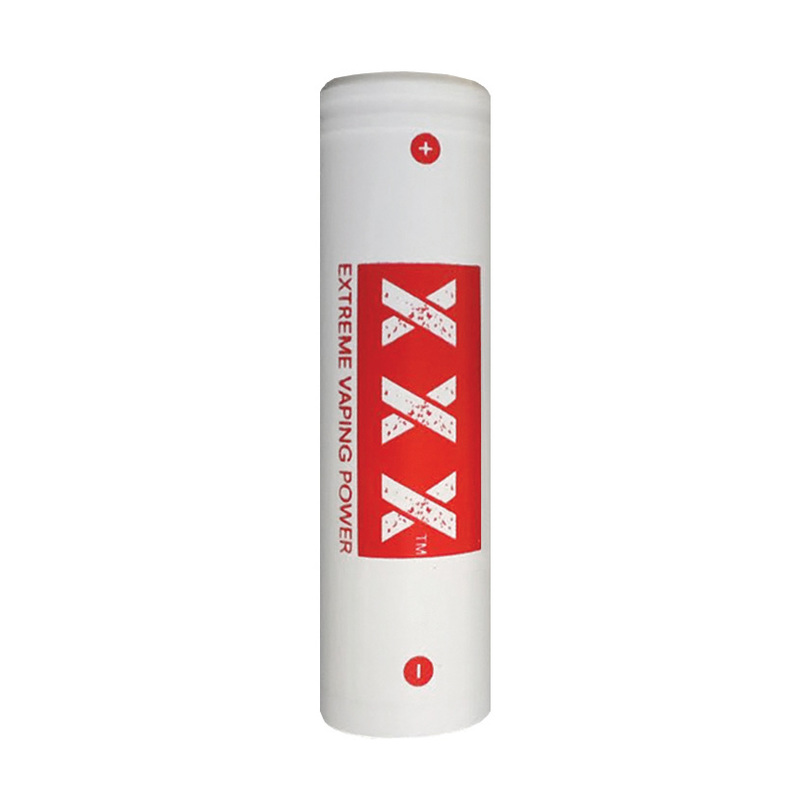 If you have a compact mod – especially small mechanical tube mods – you might encounter 18350 or 18500 size batteries, which are just as wide but slightly shorter than the standard. However, for more modern devices you’re more likely to run into larger batteries. The biggest devices use 26650 batteries, which generally last a lot longer between charges than 18650 options and can put out a lot of power too. Other options that are less commonly found are 21700 and 20700 batteries, and these generally improve on 18650s in terms of capability too. For most situations, you’ll just need an 18650 battery, but check the store you purchased your mod from, the manual for your device or the manufacturer’s website to confirm if you aren’t sure. The good news is that the different batteries are different sizes, so it will be obvious if you’ve made a mistake. The trend towards higher and higher power devices has brought with it a trend towards mods that run on multiple batteries. This tends to increase the battery life of the setup and also boosts the maximum power you can vape at. If you have a dual battery or even a three-battery mod, you need to take this into account when you buy your batteries. This is because you need to “marry” your batteries. Yes, we’re about to get about as romantic as you can get when discussing electronics and battery safety. 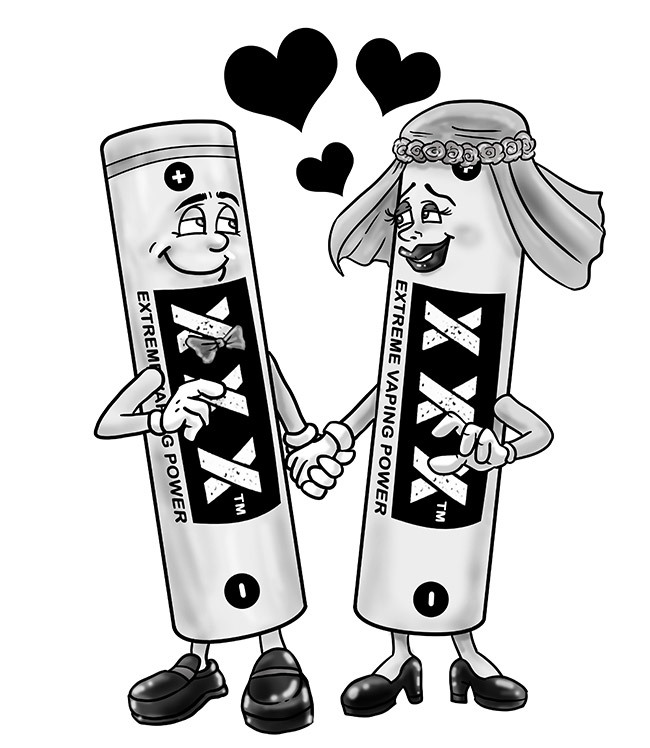 “Married” batteries are simply two or more batteries that live their lives together. You buy them at the same time, make sure they’re the same brand, chemistry and model, and only use them together. You can use the same two married batteries in a bunch of different dual-battery mods, but they have to both charge and discharge together. When you vape using a dual-battery mod, you’re essentially asking for the same thing from both batteries (not quite, but we’ll get to that). If one battery is old and the other is brand new, the older battery won’t respond as well as the new one, and probably won’t hold a charge as well either. In cases like this, one battery will end up doing more work and being under more stress than the other. One battery may be more depleted than the other, but because its partner shares some of the load, your mod will still fire and you’ll still be asking for a lot from the nearly-drained battery. Over time, situations like this could (in rare cases) end badly. The solution is to marry your batteries so they’re always in the same basic state. They’re put through exactly the same as each other, so they’re always at roughly equal charge levels, they “age” together and they share the task equally. If you have a dual-battery mod, you’ll need two married batteries. If you have a triple battery mod, you’ll need three. The only extra thing to consider is the fact that most variable wattage (VW) mods with multiple batteries run them “in series.” This means the positive end of one battery is next to the negative end of the other, and the current runs through one and then the other before up to your atomizer. This is only important if you have a variable wattage mod because it makes the situation slightly different for each battery. The first battery in the series takes a bit more stress than the second. All you have to do to make sure they both go through the same thing over time is rotate them each time you recharge. If a specific battery started in the left slot, next time you put them in the mod, move it to the right slot. The most important part of choosing a battery for your mod is making sure it will be safe. This is really easy to do with variable wattage (regulated) mods, because the device itself will have safety features built-in that prevent you from asking for too much from your battery. However, you still need to a get a capable battery to vape safely. The key is the “amp limit” of the battery. This tells you the most current you can ask for from the battery to stay within its safety limits. On battery specs, the piece of information you need is the “maximum continuous current” rating of the battery. This is a number in amps (A) and it tells you how much current the battery can safely provide on a continuous basis. You can look this up for your specific battery online, but the information should also be available at the store you bought the battery from (e.g. the Extreme Drain 18650 has a 20 A continuous drain). The important thing to note here is that you need the minimum voltage your battery will operate at, and the lower this is, the more amps you’ll be drawing as you approach it. So you can get an idea of how much power you’ll be drawing by performing a quick calculation and assuming 3 V is the minimum your battery will get to. 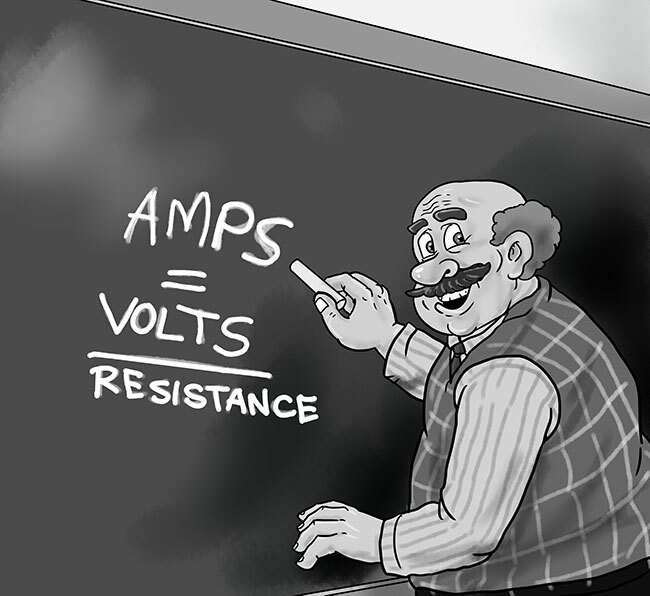 For example, firing at 60 W gives: amps = 60 W / 3 V = 20 A. This is within the capabilities of the highest amp limit batteries on the market, but beyond what some simpler cells can offer. Note: Technically, when we vape we “pulse” the battery, so a battery’s higher “pulse” rating could be considered more appropriate. However, as a safety precaution, it’s better to avoid exceeding the continuous current limit regularly. The best tool for all of this is Steam-Engine’s battery drain calculator. You can set it to calculate for regulated mods (which most vapers will be using), and there are presets for the most common vaping batteries. As well as inputting your resistance, wattage setting and choosing a battery, remember to drop the “Battery Voltage” field down to 3 V to give a bit of a “worst case” calculation. In reality, you’ll charge your battery before it reaches this point, but to stay absolutely safe it’s better to be cautious in your calculations. The “Battery drain” section tells you how much current you’ll draw, and the “Amp limit” section tells you how close you are to your limit (the “headroom”). All of the above is important to understand, but it’s important to note that you won’t really need to do this most of the time. The best advice for anything besides very extreme situations is to just get a battery that has at least 20 A of continuous current, assuming you’re going to be vaping sub ohm at high powers. You’re unlikely to go above this, and regulated mods have limits hard-coded into them to keep you safe anyway. 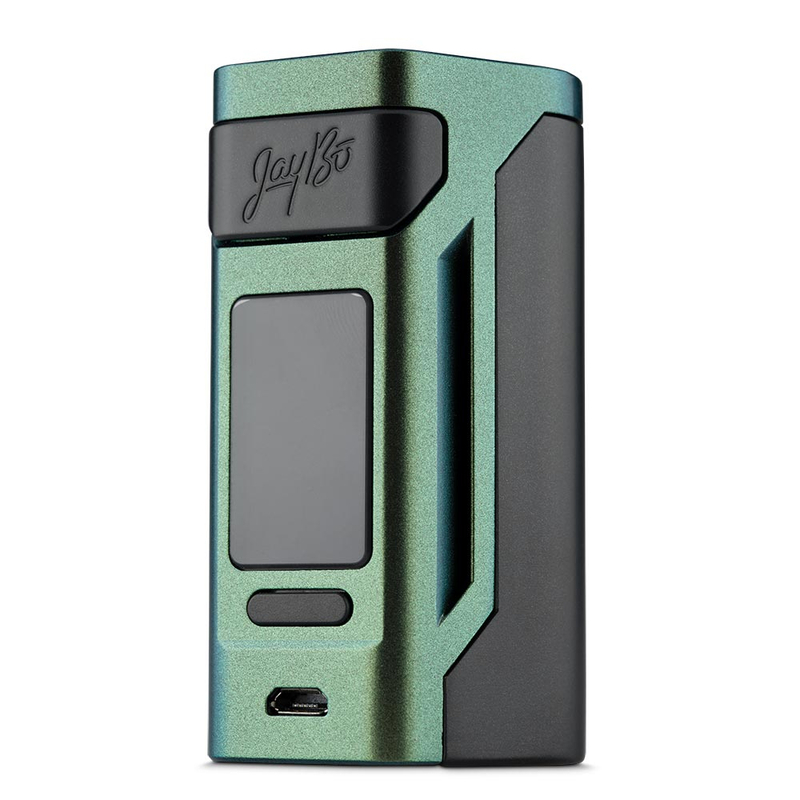 The discussion so far has focused on “regulated” mods, which are variable wattage or voltage devices that have in-built safety features and limits to prevent you trying anything dangerous. However, “unregulated” or “mechanical” mods don’t have these safety features. 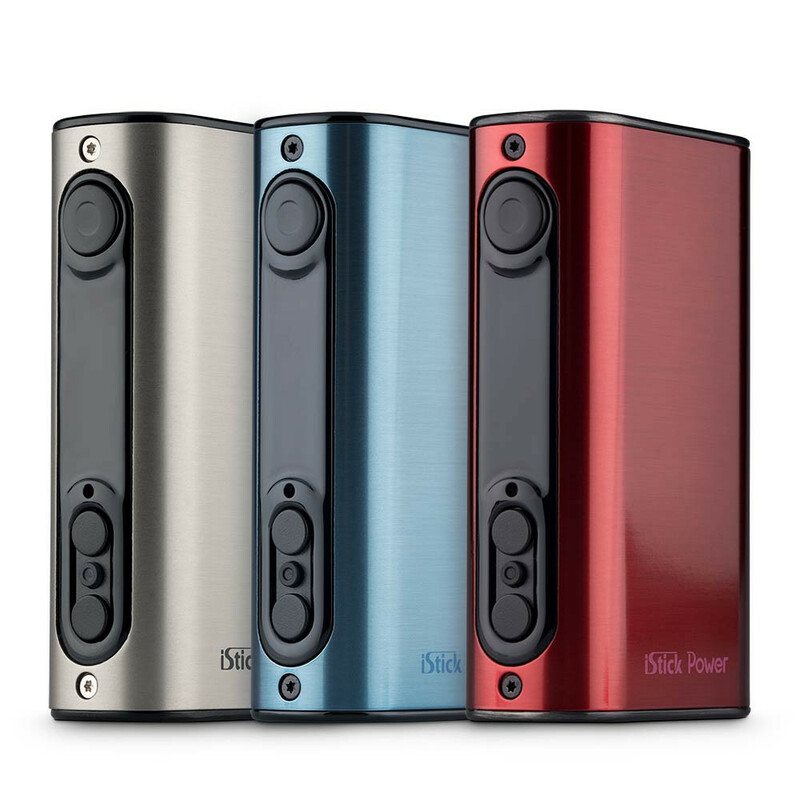 They’re much less commonly-used these days because most regulated mods can put out more power, but you may still encounter unregulated box mods occasionally. This is well within the capabilities of most vaping batteries. Again, you can use Steam-Engine to check you’ll be vaping safe with an unregulated device. Unregulated mods that use more than one battery have an additional complication to think about. For these devices, the difference between series arrangement (positive ends at different sides of the battery slot) and parallel arrangement (the positive ends at the same side of the battery slot) is very important. 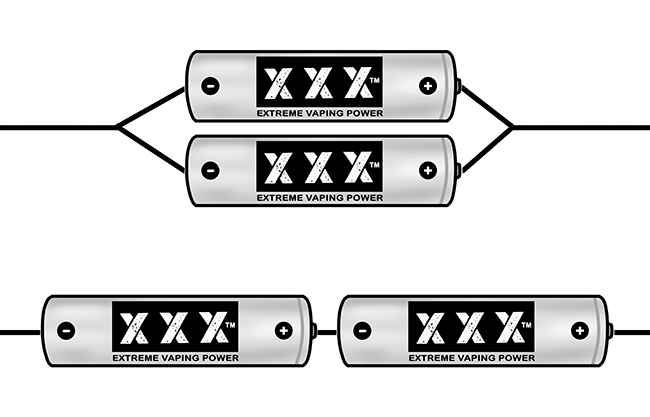 Mechanical box mods with two batteries arranged in series have double the voltage of a single battery version, but the same amp limit. For parallel arrangement, the voltage stays the same as for one battery but the amp limit doubles. In short, series “stacks” the batteries and increases the voltage while parallel runs them both and splits the amp-load between them. Parallel is generally safer, but vapers looking for big clouds will prefer the punchier series arrangement. Provided you take the difference between the two into account, you’ll be able to check that your batteries can provide what you’re asking for. So now you know what you need from a vaping battery, you can start to think about what you want from one. What makes a good battery? The main things to think about are the capacity of the battery, the amp limit, how “hard hitting” it is and what temperature it operates at. Ideally, you want a high-capacity, high amp limit, hard-hitting battery that operates at a low temperature. As always, the decision you have to make will involve some trade-offs. The capacity of the battery is the number listed before “mAh,” which stands for milliamp hours. This tells you how long the battery can run between charges. So for example, a 2,000 mAh battery can run at 2,000 mA (i.e. 2 amps) for one hour, 1 A for two hours, or 4 A for half an hour. It never really works out this perfectly, but that is essentially what the capacity tells you. In short, all else being equal, a higher capacity battery will keep working for longer between charges. For battery capacities, bigger numbers are better. However, there is usually a trade-off between high capacity and high amp limit: you can’t often find both in the same cell. The “maximum continuous current” rating of the battery tells you how much current you can safely draw from it, as you learned earlier. Ideally, this number will be big, so you can vape with many different setups and at high powers while still maintaining a safety margin. Most of the batteries used for vaping have a 20 A limit or higher, with some reaching 30 A. You won’t find any higher than this (and you should be sceptical of any battery claiming to offer it), but you won’t really need much more than this anyway. As mentioned a minute ago, high amp limit batteries tend to have lower capacities and vice-versa. This is where calculating your needs (using Steam-Engine or a similar tool) can be very useful. If you determine that you’re unlikely to need more than 15 A under any foreseeable circumstances, for example, you can choose a higher-capacity battery and know you won’t be missing out. This is the best way to make sure you get the right battery for your needs. However, so many batteries offer over 20 A of maximum continuous current that there is no need to choose anything lower than this, and ones using hybrid INR chemistry in particular have ample capacities too. We’re going to be mentioning mechanical (unregulated) mods going forward. Mechanical mods come with a safety warning – most exploding battery stories you’ve heard about on the news come from using mechanical mods. There’s a reason for that; mechanical mods do not come with the inbuilt safety controls of other devices. That’s why we don’t sell mechanical mods, and advise against using them unless you have a seriously good understanding of the risks and technology involved. When vapers talk about a battery being “hard hitting,” what they really mean is that it has a high operating voltage. 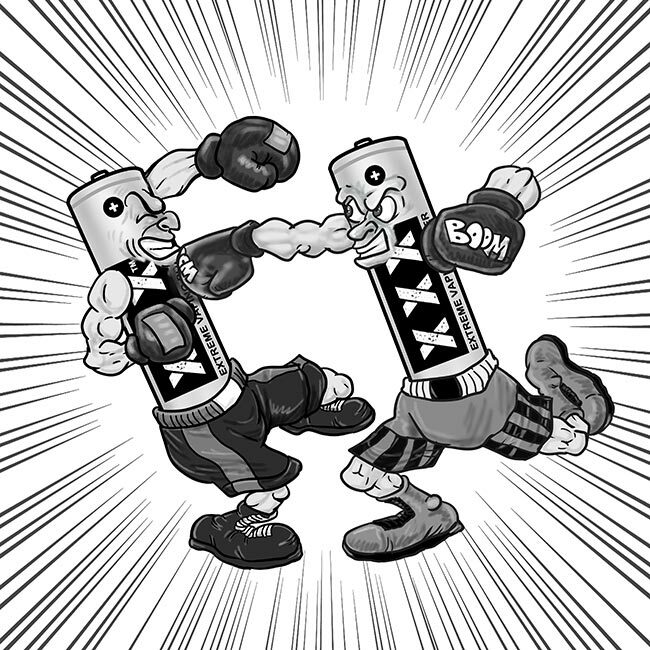 When a battery loses charge, the voltage between its two terminals is reduced, and how “hard hitting” a battery is describes how quickly the voltage reduces. On a mechanical mod, the remaining voltage directly translates into how much vapour you get, so a harder-hitting battery will produce more vapour for longer and give a better vape. Regulated devices keep the performance consistent, but a harder-hitting battery will keep its voltage for longer and not need to work as hard. The problem here is that you need to find a test of the battery to really know how hard-hitting it is. There are many places to find these (for example, stores like LiIonWholesale test batteries, as does Mooch315 at the electronic_cigarette subreddit or ECF), but for the most part this is something you don’t need to worry about too much unless you’re vaping with a mechanical device or want the very best battery you can find. If you focus on the other characteristics of the battery, you’ll find a hard-hitting one naturally. The operating temperature of the battery is something else you can only really know if you look at a test, but as covered earlier, IMR and INR batteries tend to run cooler than other chemistries. Although IMR batteries are known for their safety, INR batteries offer this same benefit and their higher power output makes them the better choice overall. The advice in this post should have given you all of the most important bits of information you need to find a good battery, but if you don’t stick to widely-recommended options there is one crucial point to be aware of. No 18650 batteries at present are rated over 30 A maximum continuous discharge. You may encounter batteries that claim to offer more than 30 A continuous discharge, but these are either pulse ratings (as opposed to continuous) or are simply over-stating what the battery can do. When experts take these batteries and put them through testing, none of them come out to over a 30 A continuous current rating. Unfortunately, if you venture away from the widely-recommended companies, inflated ratings or pulse ratings disguised as continuous ratings are unfortunately common. If in doubt, stick to a recommended manufacturer, or at very least find a test of the battery you’re considering before making your purchase. However, as a general rule: if an 18650 battery is claiming over 30 A continuous current, the rating is probably wrong. Counterfeit vaping batteries are unfortunately quite common. Many vaping batteries are fairly simple in appearance – a single-colour wrap with a code printed on in fairly generic text – and counterfeits often really look the part. Battery Bro has an interesting article looking at LG H2 batteries and trying to identify a counterfeit among four. The short version is it takes a lot of detailed work to really work out whether a specific battery is counterfeit. The counterfeiters improve their replications regularly and most of the advice is quite specific to the battery you’re dealing with. Learning a little about a battery’s appearance and characteristics, and doing a bit of research online, you can spot sloppier fakes with a bit of work. However, the simplest and best advice is to only buy from reputable sellers, and avoid cut-price eBay sellers or dodgy market stalls. If you want to step outside of the vaping industry, torch/flashlight companies are very serious about their batteries and you can often pick up some batteries used for vaping from places like Illumn. There are also some specific batteries that are frequently counterfeited, such as the vapers’ favourites Sony VTC 4 and 5. Finding an authentic one of these is a challenge, to say the least (since Sony no longer manufactures them), and realistically you’re probably better off just choosing a different battery altogether if you’re concerned about fakes. Making sure that you don’t exceed the amp limit of your battery is one of the most important things to keep in mind when you’re vaping using a mod with an external battery, but there are a few other key tips you need to follow to stay safe. In fact, Most of the time you see an e-cigarette explosion in the news, it’s because somebody hasn’t followed battery safety advice. As well as making sure you get quality batteries, you should also look specifically for high quality battery chargers. The most important thing is to get a charger that protects against overcharging, and comes with plenty of safety features. There are a lot of suitable options on the market, but the Nitecore Intellicharger i2 is a perfect example of the sort of thing you should look for. It features an automatic cut-off for when your battery is fully charged, with two independent bays for your batteries, LEDs to show the charging status of each one, reverse polarity protection and over-charge protection. 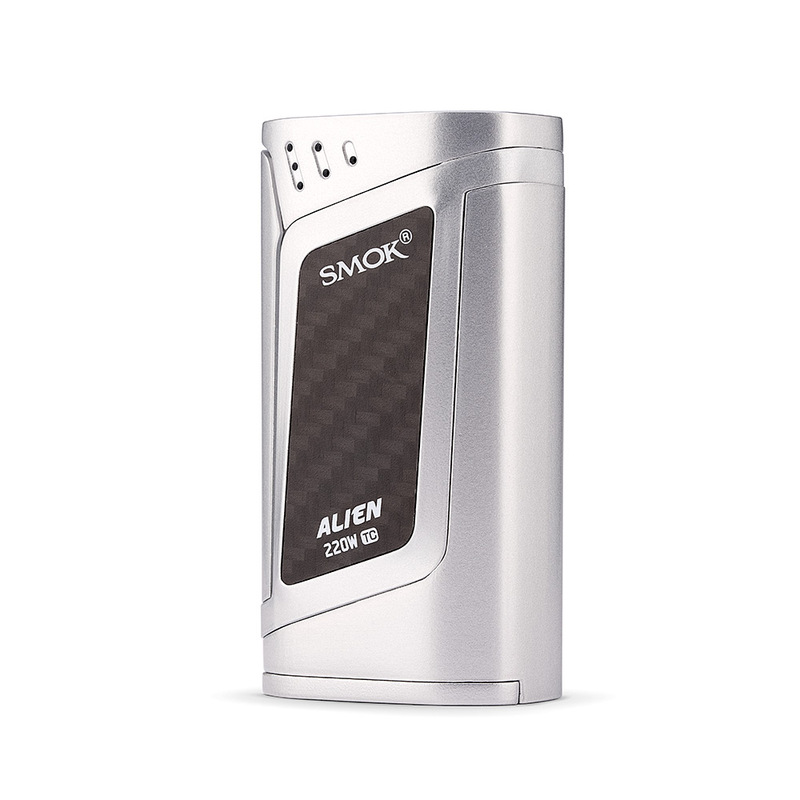 It charges Ni-Cd and Ni-Mh batteries in addition to Li-ion ones, and can support most battery sizes you’ll encounter as a vaper. It also has a fire retardant design and ventilation on its body to help heat dissipation. 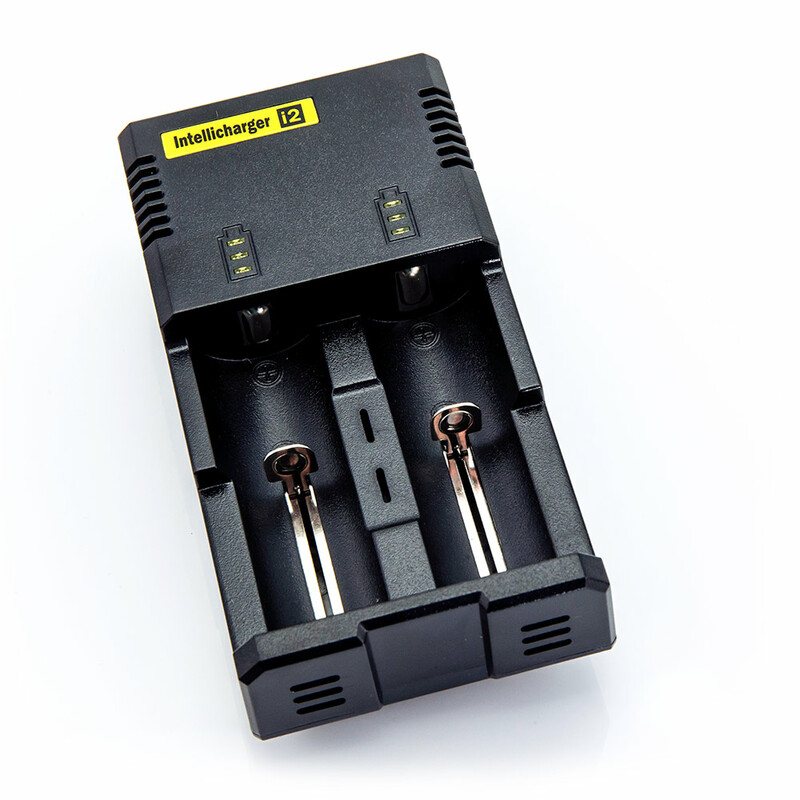 The Intellicharger i2 is far from the only charger that ticks all the boxes for vapers, but it gives you a good guide as to the type of things to look out for in a quality battery charger. The most important thing is that the charger shuts of automatically when your batteries are fully charged, but support for a wide range of battery sizes and independent monitoring of the battery bays are important features for a dependable, flexible charger. Nitecore in particular has a great reputation, but there are also some quality, feature-packed chargers available from Xtar and Efest. Of course some mods offer on-board charging too, but for £16, picking up something high-quality like the i2 is well worth the investment. This post has given you a detailed run-down of the most important things you need to know if you’re going to vape with an external battery, but it’s important to remember that this isn’t absolutely necessary. Using separately-bought batteries does offer a wide range of benefits, in particular the flexibility to take spare batteries out of the house with you and choose your battery to suit your preferences, but if you want things to be as simple as possible, mods with in-built batteries work just as well and are more user-friendly. 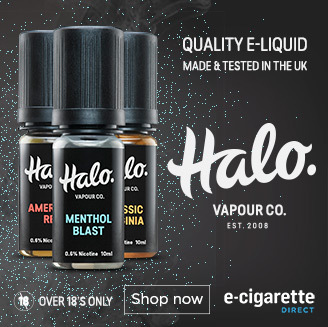 However, despite the detail in this post, once you’ve picked up a few batteries for your mods, using external batteries really isn’t much more difficult than vaping using mods with in-built batteries. The only real difference is removing and replacing your batteries when you charge, and ensuring you carry any spares around safely. For this limited additional effort, external batteries offer a hugely more flexible and sustainable solution to powering your vaping devices. Once you’re familiar with the most important pieces of safety advice, the benefits far outweigh any costs. Mods that take separate batteries are a little more complicated than ones with in-built batteries, but as long as you follow a few key bits of advice you can vape with confidence. To work out how many amps you’ll draw using a VV/VW mod. Use 3 V for a “worst case” calculation. 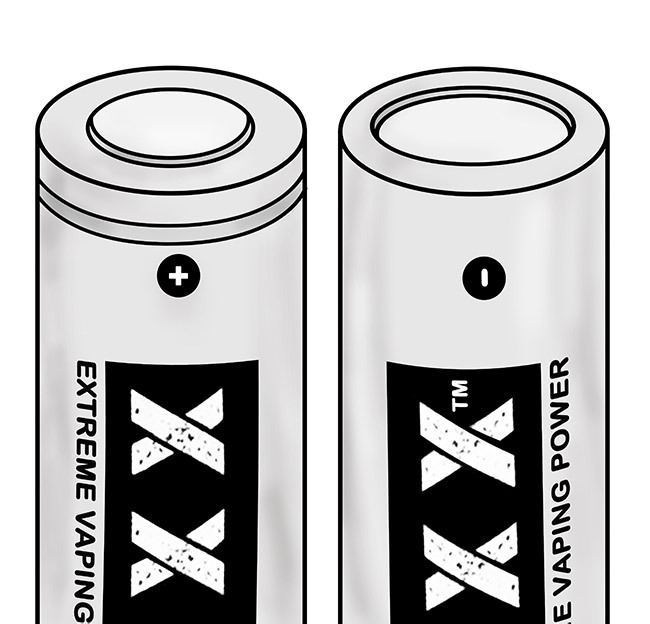 For single-battery mods, the maximum voltage is 4.2 V.
The amp limit (or the “maximum continuous current” rating) of a battery tells you how much current it can provide: anything 20 A or over is suitable for most vapers. The capacity (measured in mAh) tells you how long a battery can last between charges: bigger numbers are better! Choose reputable vendors when you’re buying batteries to ensure you don’t end up with a counterfeit! If your mod takes more than one battery, use “married” batteries. This means that the batteries live their whole lives together. Get batteries that are the same type, buy them at the same time, charge them together and only use them together. Then you can be sure one battery isn’t under more stress than the other; they share the load equally. Lee is a freelance writer and vaper, with a passion for accurately communicating the science on vaping and dispelling myths. Regular blogger and reviewer at EcigaretteReviewed. Drinks too much tea.